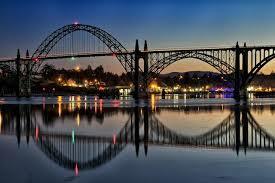 One of the most recognizable bridges on the Oregon Coast, the Yaquina Bay Bridge is a Newport icon. The bridge stands 135 feet above sea level, and spans 3,260 feet between downtown Newport and the South Beach area. The bridge was designed by Conde McCullough, designer of many bridges along U.S Route 101, and opened to the public on September 6th, 1936. The Yaquina Bay Bridge was placed on the National Register of Historic Places on August 5, 2005.